Reed Elsevier Ventures — the London-based venture arm of Reed Elsevier, one of the largest publishing companies — is leading a $6 million investment in the parent company behind GigaOM, GigaOM.tv, GigaOM Events and GigaOM Pro. Current investors in the company, Alloy Ventures and True Ventures, are participating in this new round of funding. REV General Partner Kevin Brown is going to join the board of our company, joining me, our CEO Paul Walborsky, Alloy Ventures’ Ammar Hanafi and True Ventures’ Jon Callaghan. With who-what-where out of the way, let me focus on why we are raising new capital. The answer is GigaOM Pro, our new research service that has a unique twist on the multi-billion dollar a year research business. Just as we never positioned GigaOM to compete with traditional media outlets, I believe we are charting our own course with our GigaOM Pro research service. And it is working. It is working so well that we really need to put more gas in the engine to grow it even faster. I know my mom will get upset when she sees me tooting my own horn, but for once I think she will overlook my indiscretion. Because it is not about me, but the collective achievement of Team GigaOM. In 2008, right after my heart attack, I told Paul and our board a very simple thing — this company cannot rely on one person, one revenue stream and one business. Our focus as a digital information company shifted from page views to engagement. And once we made the shift, we came up with the revenue models that match our core value proposition — content with high impact. It matched who I was, who our writers were and, more importantly, the DNA of our company. A few days ago, I wrote how Skype has been one of the defining companies of my career and how it has dovetailed with my own personal life. Nearly three years ago, Faisal Galaria, a former Skyper, moved to San Francisco and introduced me to Kevin from REV. At that time we were small and were embarking on a makeover. Kevin stayed in touch and watched the company find its way. These were three tough years – my own personal physical limitations, the housing crisis, the global economic meltdown. We bobbed, we weaved, we learned, we adapted and we grew. But we always were focused on the long term – building a sustainable information business. And in the end that is what made Kevin and his partners at REV believe in us. What has worked for us, in the simplest form, is the GigaOM team! Even with some of us leaving to pursue new opportunities, over the past three years we’ve created a GigaOM company culture of working together, for each other. And there is a unified belief in building something for the long term. A lot of that has to do with our leadership. Paul, who took over as the CEO under extremely trying circumstances, has led from the forefront, working tirelessly to make sure that we are doing the right thing. One of those things that the media just constantly gets wrong is this idea that it’s a person. It’s never a person. It’s always a team. The most important thing for you as an entrepreneur trying to build something is, you need to build a really good team… recruiting, finding good people, both outside the company and inside the company, to put them in more impactful roles. I might be the founder of GigaOM, but it is our team that is its soul, its heartbeat and its future. We have demonstrated that paid content (not paywalls) can work, as long as you can provide value to your community. The community in return rewards us with attention – by reading our blog content and participating in it, attending our events and buying subscriptions for our premium information service. Now we are going to scale our operations – and that means working on delivering more value. As I have said earlier, we are expanding our editorial coverage to New York and the East Coast. In addition, we have finalized plans to expand to Europe where Bobbie Johnson, former technology writer for The Guardian, will spearhead our efforts from London in more permanent capacity, though he will continue to write for print publications and work for broadcast outlets. If you are a GigaOM Pro subscriber, we have a lot of new things coming your way. We are going to be growing our analyst network. And there is more – just stay tuned. Great news, well communicated, Om. Congratulations! Om, you are a real inspiration to me! Rewards come to those who work hard! Congratulations and regards to you personally and to all Giga Om team! Incredibly excited to be joining the GigaOM team! uhm what is the difference between paywalls and paid content? @Dean – when most talk about paywalls, they’re referring to charging for same content that had previously been free/ad-supported. We decided to go a different route when expanding into paid content, creating an entirely new, deep-dive content division with our research group GigaOM Pro, while at the same time continuing to focus on the same verticals our community has come to known us for. It’s paid off! uhm yeh ok i’ll ask the question again….whats the difference between a paywall and paid content. compliments! I hope to raise a fraction of this amount for my blogs and websites! :)…like… http://www.DomainersGate.com... http://www.NewSpaceAgency.com... http://www.MyLowCostPC.com... etc. Congratulations Om! Now on to disrupt the Gartners of the world! Kudos to you and all the team! Amazing stuff happening! Props for all the great and hard work! Thanks Rohit. Appreciate the kind words. Om – Love what you guys are doing and continued success. We’re looking forward to continuing to build the relationship between GigaOm Pro and CB Insights over time. Congrats again! Thanks Anand. It has been a delight working with you guys as well. Looking forward to a fruitful relationship. Congratulations. It’s great to see work of depth making it online and also to see a project that started as a blog develop a successful research company. You’re definitely an inspiration! And I bet your mom will understand! Ok. I have great great respect for Om Malik when he was guest on Cranky Geeks. So i am definitely not trying to start a flame war. Just wanted to point out that from my observation on the free content. I can’t find a voice that doesn’t make me think this is written by John, Jennifer or Sarah, etc. Its always sounded like Om Malik yourself. Maybe the paid content is different. It might be a cool idea to have a paid article on the free site once in a while to see what GigaOm is all about. And not what Om Malik is about. Om, Congratulations to you and the GigaOm team! You have done an amazing job creating content that matters. I always know when I read a GigaOm story that it will be insightful, well researched, witty, and balanced. You are a true gentleman in a tough industry. Good guys do win! Financing is great validation that you have built a company of enduring value. Thanks. The credit goes to the team. For past three years, it is them and not me. They have worked incredibly hard to build a great place and a great culture. I am merely here to get credit. Wallstreet journal, nytimes and Gigaom all charge for paid content. Anyway. Trying to say that selling your content is different from nytimes selling their content is a perfect example of the single voice that i expect. Its like how you agree with EFF and say that he has a good view point in a future article. Could not be more excited for you and team, Om. I’ve been a long-time reader (back to Business 2.0) and always enjoy the quality writing here. You cover many of the same topics that I can read about at MobileBurn, Engadget, etc, but with a fresh perspective that I’ve always enjoyed. Keep up the great work. Any plans to expand into gadget news or games news? We are going to be methodical. I think we do enough gadget news on our sites :-). Games is not our thing unless it is Angry Birds, which is what we love. Shame Om, I think your teams content style could of worked well covering games (more the business side of it). Congrats Om on another round of funding . You have proved that the numbber of daily posts is not important but the content inside them is . And another congrats because no one was able to scoop the story before you broke it . GigaOM, one of the few sites still providing consistently good and insightful coverage, and not pure linkbait. Huge congrats, totally deserved! Thanks Rafat. I am in agreement on Kevin. He rocks. Congratulations! When are you creating something in India? (You could buy a blog like PluggdIn or Trak.in or something. NB:I’m not involved with any of these blogs). Hope there is plan for more than a single voice and mind. 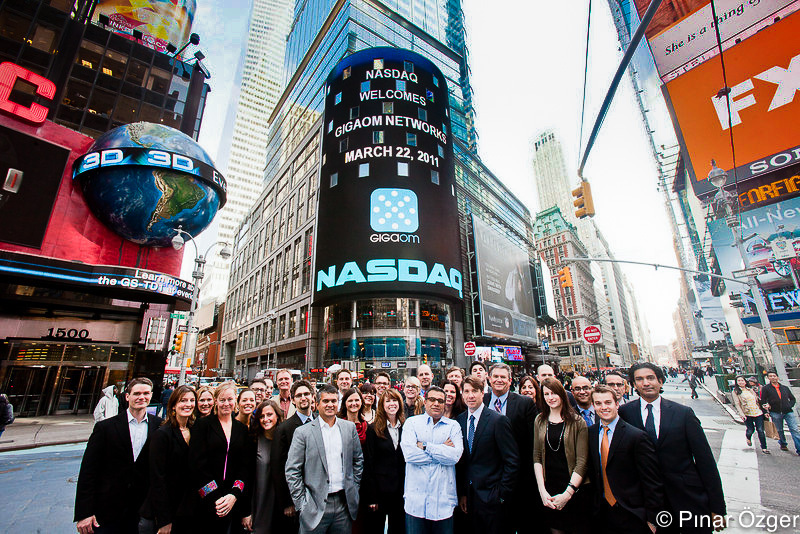 Congrats to the GigaOM team! Big ups to you and the team, Om. Stoked for you guys. Thanks Sameer! Appreciate the love.